시험이 있어서 열심히 공부해야 해요. I need to study hard because I have a test. 일이 생겨서 집에 가 봐야 해요. I need to go home because I have something to do. The coins fell in the street. Please lend me some coins. I’m late because of a traffic jam. There are many cars on the road. 그래서, 뭐요? = So what? Since I caught a cold, I rested. 건강이 안 좋아서 병원에 갔어요. I went to the hospital since I’m in bad health. Since I was tired, I slept. 다른 약속이 있어서 만날 수 없어요. I can’t meet you because I had another appointment. Since I had a headache, I took some medicine. I ate a lot because I was so hungry. I couldn’t do my homework because I was so busy. 배가 아파서 약을 먹고 쉬었어요. Since my stomach was upset, I took some medicine and rested. 숙제가 많아서 놀 수 없어요. I couldn’t play because I had lots of homework. 시간이 없어서 쇼핑할 수 없어요. I couldn’t go shopping because I didn’t have any time. I have a strong husband. Don’t be envious of others. I’m very sleepy right now. It’s comfortable when you use the Internet. I’m really satisfied with these clothes. This restaurant is no good. I hate silk worm larva. I was indifferent to my friend. 내 친구는 질투를 많이 해요. My friend is very jealous. I can’t eat hard things. Whose thick book is this? 여기 물이 가득한 컵이 있어요. This cup is full of water. Please fill this empty cup with water. My nice friend helped me. 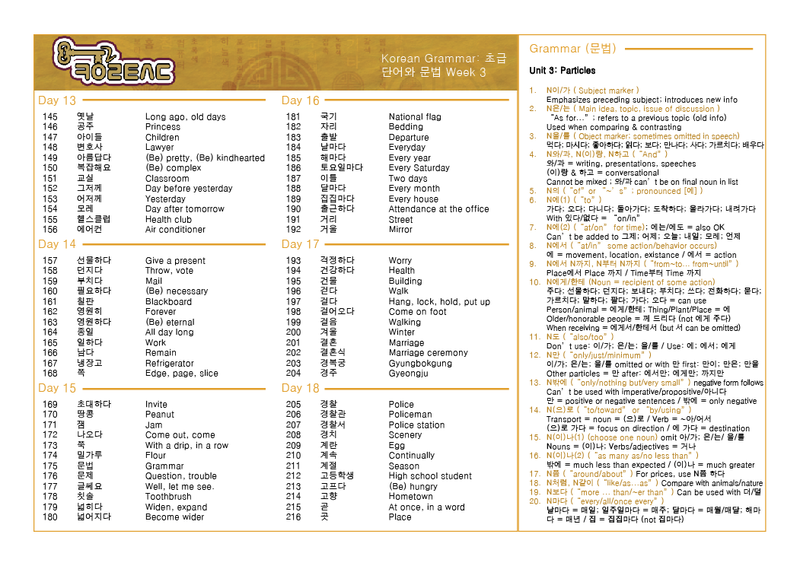 Do you know an easy Korean book? There was a flood in Seoul. Go for a drive with me. 오늘 저녁 한 잔 해요. Let’s have a drink tonight. Do you have a plan for this summer vacation? Jeju island is a famous island. Find it on the map. 이번 여름 휴가는 아주 특별할 거예요. Let’s do something really special this summer vacation. Did you reserve the airplane ticket yet? It’s especially expensive during peak season. 방학 때 어디로 휴가 가요? Where are you going on vacation during the holiday? Today is an annual paid holiday. The bookstand is totally full. Do you have a monthly day off tomorrow? He has no first job experience. We’re recruiting employees with previous experience. A trumpet is a wind instrument. Can you see the music sheet? 제 친구는 성악을 전공해서 노래를 잘 해요. My friend is really good at vocal music. 한국 팝송 부를 줄 알아요? Do you know any pop songs? Do you know any Korean “Trot” music? I like popular music more than classical.